If you’re self-employed, you’ve got the flexibility to avoid bad bosses, boring watercooler chat, and yet another meeting that should have been an email. But you still can’t outrun life’s two great certainties: death and taxes. If you’re new to the gig economy, you may be surprised to learn that in addition to filing an annual income tax return, you must also pay quarterly estimated income taxes. Unlike regular employees, self-employed individuals also have to pay the full amount of their FICA Social Security and Medicare taxes (self-employment tax). 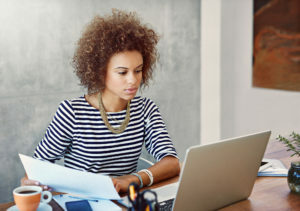 It may be tempting to pretend self-employment taxes don’t exist, but not paying the correct amount of taxes on time can lead to the IRS fining you with penalties, late fees, and interest. Luckily, we’re here to help with these step-by-step instructions for how to file your own self-employment taxes. First off, how do you know if you’re self-employed? If you’re an independent contractor, sole proprietor, or freelancer who works for other businesses or individuals, the IRS sees you as a self-employed business. That means you must pay self-employment taxes if your net earnings are more than $400 (after subtracting expenses) in a tax year. Your tax forms can also confirm that you need to pay self-employment taxes. If you receive 1099-MISC forms instead of a W-2 at the end of the year, that means you’re being paid as an independent contractor and, therefore, are self-employed. A 1099-MISC form reports your gross income at the end of the year from a business or individual you worked with. So if you’re not your client’s employee, how does that change your tax rates? Because you weren’t a traditional employee, the businesses paying you did not withhold federal income tax, Social Security tax, or Medicare tax from their payments to you. As a result, you’re the one responsible for withholding and paying all of your own taxes based on your net income. That’s why self-employed workers are taxed at a higher rate than employees at a typical job: you’re paying both the employee and the employer’s share of Social Security and Medicare. And don’t forget about the different tax schedule. If you’re self-employed, you file an annual tax return and you may have to pay quarterly taxes. Each quarter, you need to pay an estimated income tax and self-employment tax based on your net income. Heads-up: the self-employment tax includes the portion of your Social Security and Medicare taxes that your client didn’t have to pay (because, remember, you’re not their actual employee). But these quarterly taxes are only estimates. Why? Because when you’re self-employed, your income can vary from quarter to quarter. That means you won’t know your exact annual income—and therefore your total annual tax amount—until the year is over. Full-time employees let their employer withhold income tax from each paycheck all year long (after all, if you know your annual salary, you can easily calculate your income tax and divide that payment across each paycheck). But for self-employed individuals, you must pay required quarterly taxes on time, or you’ll have to pay interest. To calculate your quarterly estimated taxes, first estimate how much income tax you will owe at the end of the year. You can base this on last year’s income if you expect to make a similar amount this year and if you were self-employed for the last calendar year—and have that year’s federal tax return on hand. All you have to do is divide the amount of income tax you paid last year by four and then pay that amount quarterly. You may need to increase or decrease the amount if you think you will earn a different amount this year. If you’ve never paid taxes as a self-employed individual, use the estimated tax worksheet on the IRS website to determine how much income tax to pay quarterly. Be ready to list your expected gross income, expenses, exemptions, credits, and tax deductions for the year as you fill out the worksheet. Be sure to follow the IRS’s guidelines for what qualifies as a business expense, and keep all receipts related to your deductions as proof in case you are audited. Your quarterly estimated taxes are made up of income taxes, which you calculated in step three above, and self-employment (SE) taxes, which cover Social Security and Medicare taxes. The self-employment (SE) tax rate is 15.3% (12.4% goes toward Social Security, and 2.9% goes to Medicare). If you were a traditional employee, this tax would be split between you and your employer. But as a self-employed individual, you are responsible to pay the full amount of these taxes yourself each quarter. You can use Schedule SE (Form 1040) to determine the amount of SE taxes to pay every quarter. Your SE taxes are based on your projected net earnings from self-employment. You will find instructions on the Schedule SE form. Hold onto your Schedule SE form after you complete it because you will need it when it’s time to file your annual tax return. Now that you have calculated your estimated income taxes and SE (self-employment) taxes for the year using steps three and four, it is time to make quarterly tax payments on these two amounts. Estimated taxes are generally due four times a year on April 15, June 15, September 15, and January 15, give or take a day or two. Most self-employed people use Form 1040-ES to make their quarterly estimated payments. You can make quarterly estimated payments to the IRS online, by phone, or by mail using the vouchers found on Form 1040-ES. Remember to pay quarterly state and local taxes at the same time as quarterly federal taxes. If you did not realize you needed to make quarterly estimated payments and have missed a due date, pay what you can immediately to avoid even greater charges because the penalty is based on how many days the payment is late. Even partial payments are better than no payments, because then you will be charged penalties only on the amount that is missing. At the end of the year, self-employed individuals who have made a net income of over $400 must file their annual tax return using Form 1040. Use the 1099-MISC forms you received from your clients to help you fill out the 1040 form. Remember that even if you did not receive 1099 forms, you are still responsible for keeping track of all the payments you received throughout the year and paying taxes on them. In addition to the 1040 form, self-employed people must fill out and attach a Schedule C (or Schedule C-EZ depending on your expenses) to claim their deductibles and report how much income they made or lost that year. Along with Form 1040 and Schedule C or Schedule C-EZ, self-employed individuals must attach the Schedule SE form they used to determine their self-employment taxes in step four. Once you have your financial records for the entire year, you can check to see if your quarterly estimated taxes were correct. If you underestimated (and therefore underpaid) your taxes, you’ll use your annual tax return to make up the difference. Create a business plan, and keep detailed records of payments received, business expenses, and monthly profit and loss statements. Keep track of 1099-MISC forms you receive from clients. These records will help you file taxes and pass an audit. Keep your self-employment bank account and personal bank account separate. Create a separate account for your self-employment business so that all your self-employment income and expenses are automatically recorded in one place. Set aside money every month so that paying the quarterly estimate taxes won’t be as painful. If you set aside 30% of your income, you should be prepared. You may need to save more if you have additional state or local taxes. If possible, it’s best to pay more of your estimated taxes at the beginning of the year because many independent contractors and freelancers experience a decrease in business toward the end of the year. Use one of our recommended tax software to make the whole self-employment tax filing process much easier and less stressful. Filing small-business taxes—especially when you’re self-employed—is no easy feat. So pat yourself on the back when you’ve finished! If the whole process seems too daunting to complete on your own, check out our list of the best tax software to use if you are an independent contractor, freelancer, sole proprietor, or small business.